Bajaj’s hugely popular RS200 was first launched in India in only 2 different colors – Yellow and Red, and the yellow being character colour. Now, the Indian 2 wheeler giant, Bajaj has launched a new Fear The Black edition of Pulsar RS 200. 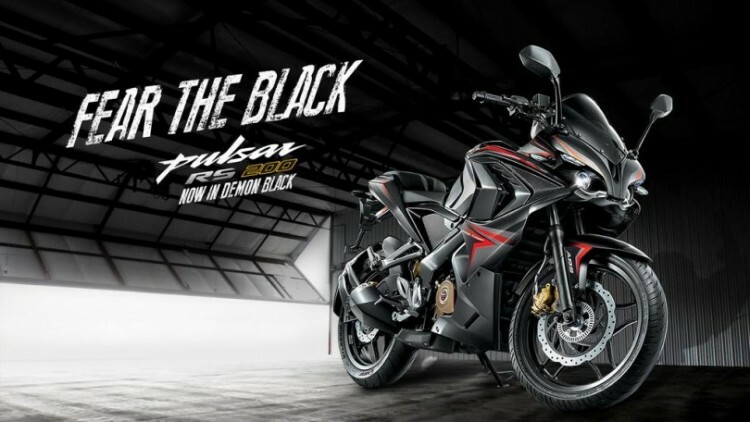 The tagline or marketing headline “Fear The Black” edition was first used by flagship Pulsar 180 few years back. Bajaj Pulsar RS200’s new color option is called as “Demon Black” and it comes in combination with grey-red dual-tone body decals. The black colour has been a legendary colour for Bajaj Pulsar right from its first model. The introduction of Bajaj Pulsar RS200 Black edition fills the gap in its Racing Sport lineup. The new color option – black certainly enhances this fully faired motorcycle’s sporty character. Also, there are also no significant mechanical changes in this new RS200 edition of the bike, therefore even the price of new ” Fear the Black” edition remains the same. The bike, Bajaj Pulsar RS 200 is powered by a 199.5 cc one-cylinder liquid-cooled fuel-injected engine that churns out a maximum power of 24.5 PS and delivers a peak torque of 18.6 Nm. The engine is mated to a 6-speed manual gearbox transmission. Bajaj Pulsar RS 200 has been considered as the most fastest and very powerful Bajaj motorcycle, we have already conducted the test ride of Pulsar RS200, which you can read about it here. Bajaj Pulsar RS 200 has always enjoyed a very strong customer response in India and other international markets since its launch. In order to match the gap in demand and supply, Bajaj has increased production of Pulsar RS 200 by suspending the manufacturing of Bajaj Pulsar NS200.